'JOKEH' - Djembe Dance Class. Venue - Unit 26N, 1st Floor, Vernon, Mill,Stockport, SK1 2HX. When - Every Wednesday. 6.30 - 8.00pm. Costs - �8.00 per class. Contact - Paul or Jokeh. West London's The Rhythm Studio is holding an induction class for those of you thinking about learning Djembe or Latin Percussion. We run classes Monday through to Thursday every week but this class is specifically for beginners. �12 payable in advance. E mail for more information...mail@therhythmstudio.co.uk or 0208 969 8616. Starts at 7.15 pm for an hour on Wednesday 27th April. We are very close to the top of Ladbroke Grove...W10 5BZ. We are also running one for kids,which is after school at 4 pm, every Thursday. 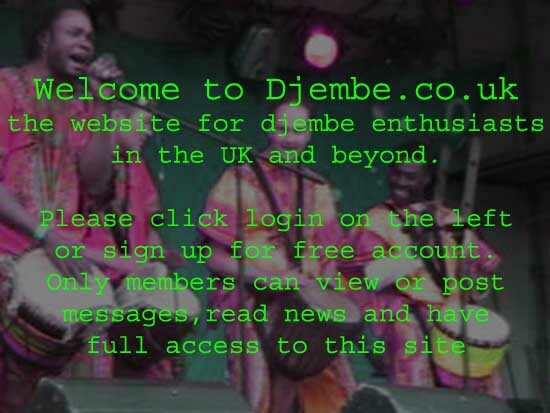 Friendly Djembe, Dundun class/workshop restarting at the Watermans Arts centre, Brentford west london. every Thursday (from 7/4/11) 7.30-9.30pm �10-7.50 with or without drum hire. Call Lu on 07881431892 or just come along. The " Deglulen" Gambian band comes to Chiswick on the 20th March @ 8.00pm. At the George IV, 185 Chiswick High Road, London W4 2DR. Tickets �8 on the door. A fun evening is promised ! Dance till you drop, with dynamic djembe, kora and Gambian rhythms. Amazing teachers, musicians and dancers from BURKINA FASO, GUINEE, MALI, SENEGAL, IVORY COAST, GHANA and GAMBIA. We will take you on a journey of West African rythmns and dance.